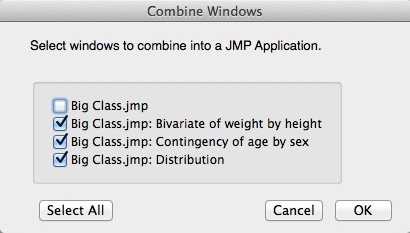 In my previous blog post, I discussed the most recognizable enhancement in JMP for Mac OS X by highlighting some of the great session management features of the new Home Window. Here, we will look at some other added functionality for the Mac, as well as provide a sneak peek at upcoming Home Window additions! One of the most useful and powerful features in JMP revolves around the brilliant functionality of Application Builder for building quick applications in JMP. Its visual interface put the power of the JMP Scripting Language (JSL) all at your command with a useful template-driven, drag-and-drop approach to building apps. JMP developers like me have access to the Application Builder API classes to allow us the ability to present useful functionality on our host platforms. On the Mac, we provide a Combine Windows menu item under our application menu Windows submenu (see Figure 1). 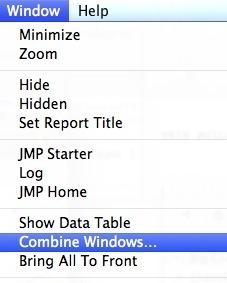 Upon invoking the Combine Windows item, a dialog appears on screen allowing you to select any set of opened and combinable windows (JMP data tables and associated platform reports) and place them together in a single application (see Figure 2). Hey...where did my Data Table go?!?! 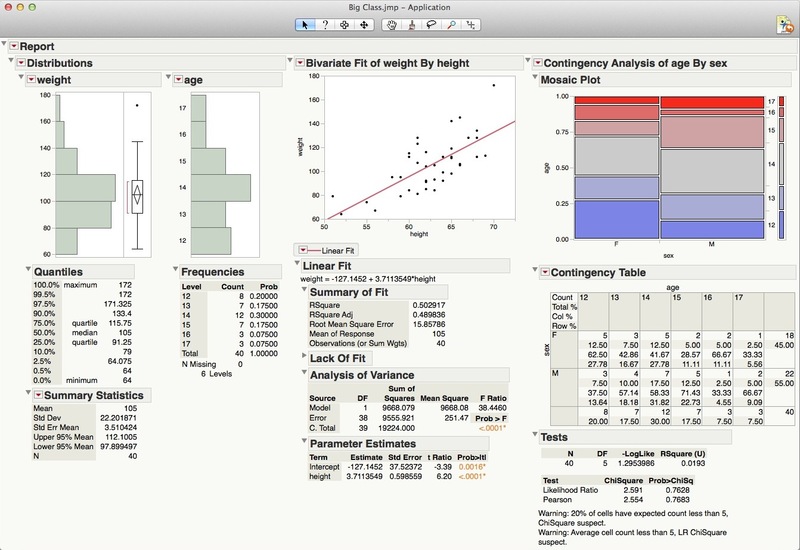 With all the wonderful platforms available to do analysis and create reports in JMP, the desktop can get cluttered and data tables lost in a sea of windows. 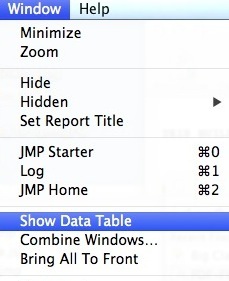 To help you get back to your data table, all JMP Reports now contain a toolbar icon, “Show Data Table” (see Figure 5). If you do not have toolbars enabled for reports, you can access the associated data table via the application menu Window submenu (see Figure 6). Finally, a sneak preview of coming attractions in the JMP Home Window. While the initial release of JMP 11 contains a functional Home Window, future releases will enable greater user interaction and direct calls into specific JMP filetype actions. For starters, dragging and dropping events will be handled by the Home Window; specifically, you will be able to open a JMP file in the Recent Files list by dragging it onto the Window List (see Figure 7), or add the file to favorites by dragging into the favorites side panel when opened. Another addition will be a button in the Home Window upper-left corner that will open a JMP log, or bring the current session’s log window to the front (see Figure 8). Finally, context menus will be added to recognize native JMP filetypes that will let you perform actions on a file listed anywhere in the Home Window. For instance, when right-clicking or command-clicking on a JSL file, you will have the ability to run or debug the script from the menu (see Figure 9). 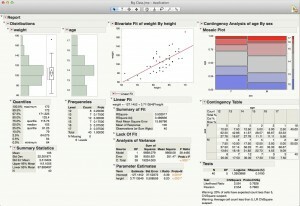 I hope all users of JMP on the Mac enjoy these added features and functionality! Please feel free to share your suggestions in comments.